MIDDLETON–The Middleton Common Council discussed a storm water utility fee increase that will be voted on by the council Jan. 15, 2019. If approved, a referendum question would be put to voters in 2020 asking to triple the rate from $15 to $45 per ERU (equivalent runoff unit) for five years. The storm water utility board made the recommendation to increase the fee to the common council after reviewing damage estimates in the Pheasant Branch Creek Corridor from the August flooding. Council president and chair of the storm water utility board Susan West explained to the council that the board reviewed costs estimated to be roughly $3,000,000 beyond regular revenue raised by the utility. The figure includes what the city expected to recover from FEMA and be awarded through grants. West said to finance the repairs over five years the board determined raising the ERU rate from $15 to $45 would bring in about $600,000 annually. MIDDLETON–On Dec. 17 at approximately 7:13 p.m., Middleton police officers responded to an attempted armed robbery at the Arby’s restaurant at 8321 Murphy Dr. The suspect entered the store, jumped over the counter and displayed a small, black handgun. The suspect is described as a light-skinned black male, around 20 years of age, 5’4, and skinny. He was wearing a green jacket over a blue hood and jeans. The hood was pulled tight to obscure the suspect’s face. He left out the back door of the business. MIDDLETON–On Dec. 4, at approximately 6:12 p.m. a Middleton police officer attempted a traffic stop on a white Dodge Neon, in the 2100 block of Allen Blvd. for failing to obey a traffic sign. The vehicle failed to stop and eluded the officer. A few minutes later Ricky Warren, 27, of Madison, called 911 to report that his vehicle, the one that eluded the officer, was just stolen from the 6500 Block of University Ave. Warren advised the vehicle was stolen by three masked men that displayed handguns and pulled him from the vehicle. Officers arrived in the 6500 Block of University Ave. and found evidence to negate Warren’s story that the car was stolen. After further investigation, and witness statements, it was determined that Warren himself was driving the Dodge Neon when it failed to stop for the stop sign. He then attempted to elude the officer trying stop him and called 911 while still driving the Dodge Neon to report it as stolen. MIDDLETON–At a special common council meeting called for the purpose of overriding the mayor’s veto on the 2019 city budget, voting or deciding on an alternative budget to the one that was approved by the finance committee the council voted six to two, exactly what was needed to override the veto and approve the budget. The property tax levy increases 2.8 percent under the adopted budget. The mill rate is estimated to be the second lowest for a city in Dane County behind Verona. The budget includes a resolution to implement a public fire protection direct charge to residents which will appear on water utility bills. The fire protection fee was included as a revenue source, generating about $500,000 annually, in the budget approved by the finance committee and published for citizens to review. Prior to voting on the budget, the council voted against the proposed water utility fee which left a shortfall in the budget for a variety of personnel items. MIDDLETON–Former town of Middleton Administrator David Shaw last month resigned and released the town from all claims stemming from his employment as town treasurer in agreements that provided him with six months’ severance pay. Former town Deputy Treasurer Patricia Keichinger entered into similar agreements with the town which offered her three months’ severance pay. However, the severance payments provided for in the separation agreements were contingent on each of the former employees signing their resignation agreement. The town board has declined to discuss the reasons for their simultaneous departures. MIDDLETON–Hundreds of people from around the area streamed into Madison Marriot West to give input on the proposed American Transmission Company’s (ATC) Cardinal-Hickory Creek project (CHC). The sessions, held Nov. 12, were organized by the Wisconsin Public Service Commission (PSC) and the Wisconsin DNR. Attendees at the meetings could review maps, the application for construction of the line and give input on the environmental impact of the project, which would potentially run through the Driftless Area. Staff from PSC was on hand to answer questions about the project and the process. PSC Communications Director Matthew Spencer said the commission welcomes input from the community. There have been sessions in Dodgeville and Middleton with a third planned in Lancaster. “It’s a great way for the public to give input, and public input goes a long way in an EIS (Environmental Impact Statement),” said Spencer. DANE COUNTY–Cleaning up waste from dairy farms and removing phosphorous just got easier for Dane County farmers with the planned construction of a Nutrient Concentration System (NCS) at the Springfield Community Digester on Schneider Rd., north of Middleton. On Oct. 30 Dane County and AQUA Innovations broke ground on the $1.6 million facility that takes low-solids manure and turns it into liquid fertilizer and clean water through an ultrafiltration, reverse osmosis and aeration. 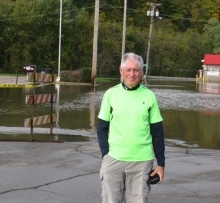 MIDDLETON–Kevin Schwendinger had to change his bike route slightly due to the flooding in Wisconsin, but rain and flooding couldn’t stop the Dubuque, IA man from continuing on his mission–a 14-day, 650-mile, bike trek to raise human trafficking awareness. “There was a bridge out, and I had to reroute around it,” he said on Oct. 4, the night he was staying over in Middleton at Holy Wisdom Monastery. Kevin planned the trip with his wife Lynn Keffeler-Schwendinger, who joined him on the first few days of the ride, because the couple had become more and more aware of the human trafficking problem not only in the US, but also the Midwest, including their home state. This couple’s previous mission work in Central America also made them want to help trafficking victims close to home. “We wanted to do something more physical to raise awareness, rather than just talk about it,” Kevin explained.